Since the “green revolution” started about ten years ago, there has been a definite mind shift in the building industry to design more sustainable buildings. In recent times the shift in focus has been to smart buildings and precincts with smart cities that are now being touted in the Middle East and in some of the developing countries around the world. Adriaan Vorster, architecture business line director for AECOM in Africa, points out that the main benefit of smart buildings revolves around connectivity and, ultimately, optimisation though the data rich environment that is created. A second advantage is that smart buildings essentially create an enabling environment for workers to deliver their best. This is because factors such as light and temperature levels are highly customisable, as opposed to a 30-to-40-year-old building with a single unintelligent air-conditioning system. For landlords, it means optimising the use of facilities, building systems and resources, such as water and electricity, due to constant monitoring. However, the Achilles heel of greater uptake in Africa remains the high cost of data, which acts as the backbone for the systems. “South Africa has one of the highest data rates in the world. In order for a smart building to work as intended, it needs the bandwidth and affordable data to act as one of the enablers. This is definitely an economic inhibitor at present,” Vorster points out. Another factor is that the physical infrastructure is lagging the smart building trend itself, such as the installation of fibre-based connectivity. “Only once this backbone is in place, can one start to develop true smart buildings and, more importantly, smart cities,” he says. Smart buildings can also not be seen in isolation. “Imagine if you connect 20 blocks of smart facilities. The overall power and water consumption will be reduced dramatically. Smart buildings can interact with each other in terms of peak power loads, releasing battery-stored power to the grid at a premium,” Vorster explains. A fully modern smart building has to adopt a holistic approach in its design, incorporating green design best practice in addition to technology. “A green building, meaning one that has been designed with sustainability in mind, is not necessarily the same as a smart building. In my opinion, smart buildings are the next evolution. They combine technological functionality with environmental drivers,” Vorster stresses. In some instances, older building stock is difficult to retrofit or refurbish, with older healthcare facilities, for example, lacking the necessary ceiling voids to run modern networks, air-conditioning and sensors. “What is also happening from a technology point of view, is that solar panels have become much more efficient, which makes renewable energy an ideal fit for Africa. Add a level of intelligence to this, such as room sensors to monitor occupancy levels, and you have a winning recipe as less usage means less generation is required” Vorster adds. He predicts that a decline in data prices, coupled with the ready availability of bandwidth, will be a crucial enabler. “It makes economic sense not only from the obvious benefits for big business, but in terms of more productive workplaces. Energy is costly at the moment, which means that buildings have to run lean and be as efficient as possible,” he concludes. Full thanks and acknowledgement are given to AECOM for the information provided. 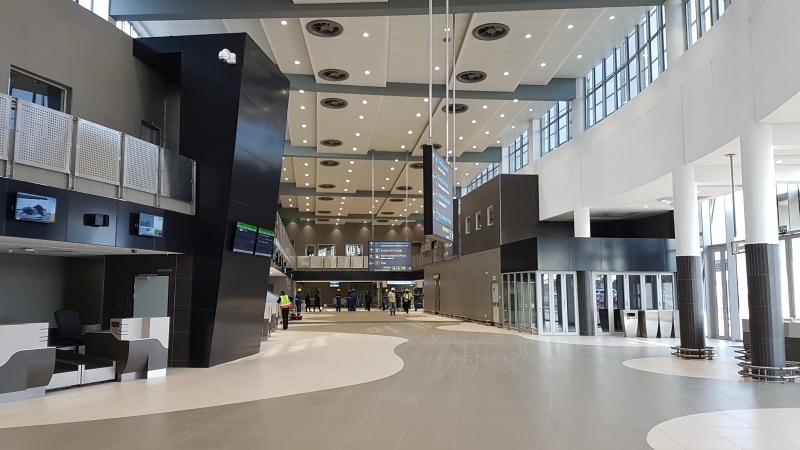 AECOM is involved in multi-disciplinary African projects such as the new terminal building at Kasane International Airport in Botswana.